In the October 2017 general elections the billionaire Andrej Babis and his populist party “ANO 2011” (“Yes 2011”) won the most votes. A Babis-led government lost a confidence vote in January 2018 and resigned, but remained in charge as a caretaker government. In July 2018 the administration, now consisting of a coalition between ANO 2011 and the leftist Czech Social Democratic Party (CSSD), finally won a second vote of confidence. However, still lacking a majority with only 93 seats in the 200-member parliament, it had to rely on the support of the pro-Russian Czech Communist Party, which since then has an informal role in the government – for the first time since 1989. 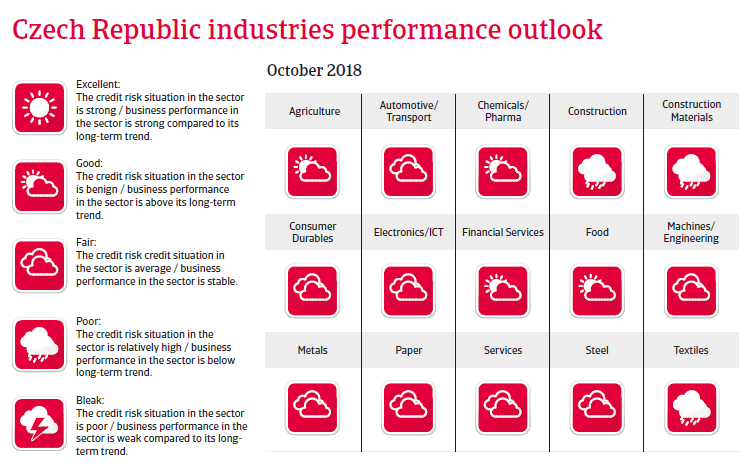 After growing 4.5% in 2017 Czech GDP growth is expected to increase at a slower pace in 2018 and 2019, as Eurozone and domestic demand are cooling down. 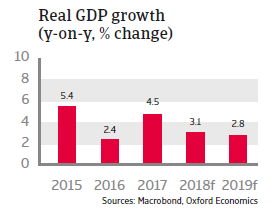 However, the economic expansion is forecast to remain positive, with annual growth rates of about 3% in 2018 and 2019. Private consumption growth has been driven by wage growth, decreasing unemployment and favourable lending conditions. In recent years export growth has been supported by the country´s improved international competitiveness. However, labour shortages are increasingly an issue, with many firms finding it difficult to fill vacancies. In April 2017 the central bank abandoned a cap (currency ceiling level) on the koruna against the euro amid rising inflation and robust economic growth. The cap was introduced in November 2013 in order to improve the country´s competitiveness, boost exports and contain deflationary pressures. Rising inflation due to surging wages and rising house prices led to gradual increases in the benchmark interest rate, from 0.25% in August 2017 to 1.25% in August 2018. Government finances are solid due to income growth and increased tax compliance. At 32% of GDP in 2017, government debt was low compared to other countries in the region, and is expected to decrease further. The good state of public finances means that the Czech Republic should have no troubles adhering to the adoption criteria of the euro. However, entering the eurozone still remains a controversial issue in Czech politics, with public opinion against it (in the October 2017 general elections pro-EU parties won just 40% of the votes). Therefore, a eurozone entry in the coming years seems unlikely. Despite the generally benign outlook, downside risks remain. 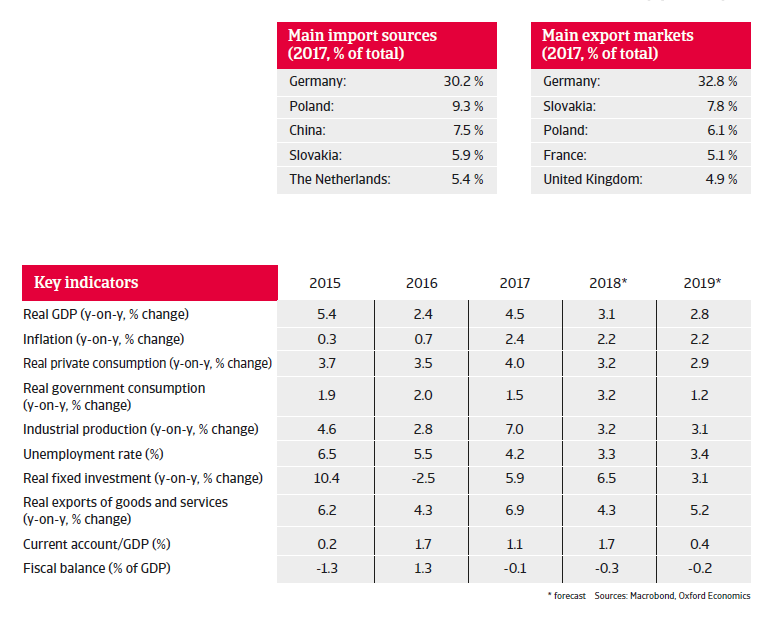 At more than 75%, the Czech Republic’s export-to-GDP ratio is one of the highest in the EU, and due to foreign investment, the Czech economy is highly integrated into international value chains. This makes the country vulnerable to foreign trade losses. 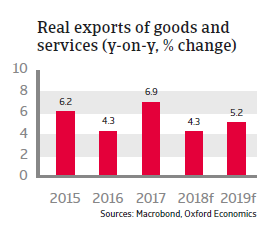 The main risks in this respect are rapid exchange rate appreciation hurting international competitiveness and sharp declines in external demand, e.g. triggered by increased political uncertainty (Brexit), an escalation of international trade disputes or a sudden slowdown in the eurozone.